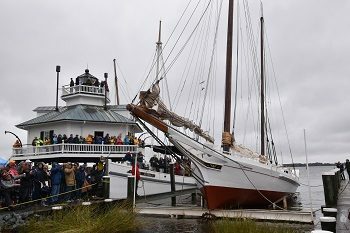 Edna Lockwood is relaunched into the Miles River on Oct. 27, 2018, in front of a crowd at the Chesapeake Bay Maritime Museum. The National Historic Landmark underwent a two-year restoration of her nine-log hull, and will be visiting Historic St. Mary’s City on September 28, 2019 as part of a heritage tour dedicated to educating the public about traditional Bay boatbuilding techniques and the oystering industry past and present. For more details about the visit, contact Info@DigsHistory.org. Photo courtesy of the Chesapeake Bay Maritime Museum. Edna Lockwood, the last historic sailing bugeye in the world, will be visiting Historic St. Mary’s City on September 28 during the RiverFest celebration as part of a National Park Service-funded heritage tour around the Chesapeake Bay. Owned and operated by the Chesapeake Bay Maritime Museum, Edna Lockwood recently underwent a two-year restoration of her nine-log hull. She was re-launched into the Miles River in St. Michaels, Md., in fall of 2018. This summer and fall, Edna is traveling to ports around the Bay, bringing free experiential programming and interpretation of traditional Chesapeake Bay boatbuilding techniques and the oystering industry past and present. During her stay at Historic St. Mary’s City, CBMM staff members will offer free deck tours, giving guests a chance to explore the bugeye while she’s docked. On September 28, Historic St. Mary’s City and RiverFest will be free admission during operating hours of 10:00 a.m. to 4:00 p.m. Built in 1889 by John B. Harrison on Tilghman Island for Daniel W. Haddaway, Edna Lockwood dredged for oysters on the Chesapeake Bay through winter, and carried freight—such as lumber, grain, and produce—after the dredging season ended. She worked faithfully for many owners, mainly out of Cambridge, Md., until she stopped “drudging” in 1967. In 1973, Edna was donated to the Chesapeake Bay Maritime Museum by John R. Kimberly. Recognized as the last working oyster boat of her kind, Edna Lockwood was declared a National Historic Landmark in 1994. For additional details on Edna’s visit, call Historic St. Mary’s City at 240-895-4990 or email Info@DigsHistory.org. To learn more about Edna Lockwood and the Chesapeake Bay Maritime Museum, including a full list of stops on Edna’s heritage tour, visit cbmmshipyard.org/ednalockwood.